'Twas The Night After Christmas. And the Grinch has got me in his grips; no bowl game for the Falcons, shameless, scum-sucking 6-4-1 Notre Dame is here in Tempe for the Fiesta Bowl, it's raining, and somehow Santa missed on delivery of the sailplane again this year. Go figure! But on the “high side" – 1) got 10 letters/cards through the traditional mail, 2) received E-mail from six of you, 3) got/made a couple of phone calls, and 4) my daughter is mostly recovered from a bad case of mononucleosis/hepatitis. (Counsel to those with younger children, if you get the chance to expose your kids to this prior to their sophomore year in high school, do so)! Oh yeah, there’s another thing to be thankful for! Messrs. Duesing, Dyche. Fritzsche, Johnston, and Mahrer haven’t called to harass me for misspelling their names in the last column. Sorry guys, you'll recall that last issue was produced in the midst of a move and l guess the dictionary was already packed. The First Derivative Of '75 is '98! That is, the first offspring descended from our class is “on-board” and will graduate in 1998! Mike and Jan Banker's son is already well through his doolie year. Thanks to Paul Kent for the info. Paul and his wife, Sherri, are on the other end of the parenting spectrum; their oldest is coming up on four and the youngest is less than a year. Wonder if they’ll be the only folks at the 20-year Reunion carrying a diaper bag? Speaking of the reunion, I talked to Mark Wells tonight. At (my) this time (10-12 weeks before you’re reading this) all is on course. Several volunteers have stepped forward and the AOG staff has been particularly helpful. By (your) this time you should definitely have received a mailing or two from the AOG about accommodations and whatever. You’re asked to do two things: get your response in return mail by the noted deadlines and do NOT assume other classmates have received the info–ask them! Max participation = max fun. Quick asides: It's not just our reunion planning that’s being handled well, the institution is in great hands with guys like Mark on the staff! Our discussions spilled over into issues involving the new T-3 (replaces theT-41) flight screening program and how it will place additional demands on a program that’s far more sliced, diced, stretched, and jam packed than the one we went through. And it’s a program with far, far less post-graduation certainty/pay-offs. I have every confidence that Mark and others like him (officers who have immense concern for both individual cadets and for the institution) are “holding the fort", but it reminded me that we all have to stay alert and involved if sanity is to prevail over the insiders and outsiders who would give us a civilian staff and these spiffy (read “senseless") new uniforms. Aside #2: The 18 (out of 19 eligible!) guys who made O-6 “in-the-zone" on the last board (classmates with prior service) should not remain nameless. Congratulations to Akers, Awtrey, Benjamin, Bock, Stephen Brown, Craig, Dalson, Defoliart, Demitry, Dichter, Dowdy, Heald, McDaniel, Peck, Percival, Saxman, Shugart and Wells. Mailbox And Stocking Stuffers. Received one "just because" letter and eight Christmas cards from our classmates (hopefully there will be more next year in response to the Hackett's once-every-three-years mailing of cards this year). 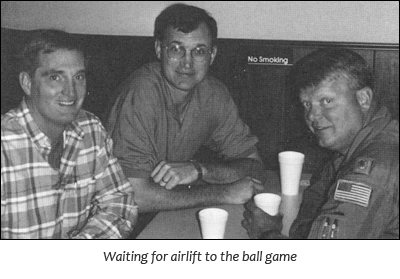 The letter came from Terry Young who sent along this picture of himself, Chuck Demoisy, and Gary Vosburgh. Believe l have previously noted that Chuck is associated with the C-9 Reserve unit at Scott and that Terry is 375 Services Squadron CC. Gary is in HQ AMC/XP. Occasion for the picture was an abortive attempt to catch a flight to see the USAFA-Northwestern football game. Mark Volcheff jotted a very short note with his Christmas card to say he was “drowning in books at Air War College with about a dozen other ’75ers" and that they would send a photo for the next magazine. Consider that now a matter of public record guys. Got a card and a call from Dennis Brooks; he, Leslie, and Becky are still in the Springs. Dennis is still largely confined but is slated for more back surgery this spring that will hopefully provide some relief and allow for some travel. In a real show of solidarity Leslie is planning on taking the same path many of you will and will be retiring (in her case from the USAF Reserves) in 1995. Denny said he’d seen/heard from a couple of classmates. Rick Douglas is at Langley AFB and is involved with teaching in the international Search & Rescue School there. Rick’s apparently leaning toward the retirement thing, returning to Salt Lake City area and getting involved with family business. 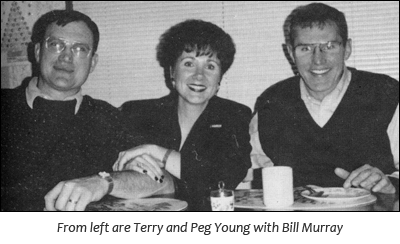 Of course Denny was also up-to-date on his brother-in-law, Greg Sheridan. Greg and Renee are still at Dover where he's flying (but not as much as he’d like to) C-5s and she's opened an art studio. In Greg's case, the retirement thing could be deferred if he's successful in getting an ROTC Detachment assignment. Dennis also noted that his part-time, down-the-street neighbor, John Traxler, was home from a Korean remote assignment for a few days at Christmas. Even In The Reserves, It’s A “See-The-World” Deal. Just reading Jim and Katie Carlson’s card qualified me for some frequent flier miles! In the past year his Navy Reserve job sent him to Washington, DC, Omaha, Saudi Arabia, and Reno (I want to know what the Navy does in Reno). There’s now talk of an extended TDY to Italy in`95. And just so they don‘t have to put up with too much of that Minnesota weather, when Jim hasn’t been gone for the Navy he and Katie have vacationed in Southern California and the Grand Caymans. I can‘t tell you whether Jim's travels have distracted from or been a benefit to Katie's prowess as a second-year law student. Waiting For A New Passenger? Now that Mark Donnelly is on the permanent Air Force One crew, he‘s thinking that maybe he won't retire in ‘95. He, Lucy, and the kids will be adding to the sense of belonging in the DC area by moving off base next summer. A very pleasant surprise as Okinawa/Osan buddies Dave and Ann Fleming sent us a card to say "Howdy" (they're at Sheppard AFB, TX now). Dave has taken command of the 80th OSS there and, despite the hours, loves what he‘s doing. Ann is busy with volunteer work, being the commander‘s spouse, and being mom to Katie who is now officially a teenager. Wayne and Amy Willis and their four kids made a short PCS last year, moving from Alamogordo (where they’d been for nine years!) up to the “big city". Albuquerque and Kirtland AFB. Wayne‘s now with HQ/AFOTECH but is thinking about other post 4 June 95 opportunities. Here‘s another couple with a son in college! Dave has followed in dad's footsteps and is playing football at Rick`s junior college in Idaho. l don‘t think there is much to tell you about Kent, Carol, and Megan Traylor that hasn’t been in one of the last couple of issues. But, hey, they're such a good-lookin' family, here's their picture! A “Multi-Media” Greeting. I think Dale Meyerrose must have sensed his error (sending a Christmas card with signature only, no note, no letter, no nothing) as he fired off a last-second e-mail on the 22nd of December. Dale, Linda, and the girls are back in Europe where Dale is the HQ USAFE/SC. Dale’s travels around Europe have allowed him to gather the following: “Saw Mark Beesley in Morocco a couple of weeks ago during African Eagle exercise. Mark’s stationed at Lakenheath. ‘Smokey’ Bauman heads up senior officer assignments at USAFE/DP. Jim Ritter used to hang out in USAFE/DO but is now the Ops guy for Operation Provide Comfort in Turkey. John Misch is on my staff. Bob Dorsey is a squadron commander at ‘Spang’. Phil Romanowicz hangs around the 32nd Air Operations Group at Ramstein." Remembering What Christmas Is Really About. The final card/letter I have to pass along had a lot to do with me getting in the right focus for Christmas – I hope that it'll give each of you some meaningful reflections as we move toward Easter. Cynthia Steward sent a beautiful update on how she and John Michael have been doing in the year since Stew’s tragic death (17 Dec 93). l guess it's a case of nice people seem to know nice people as Cynthia gave a long account of relatives and Air Force/personal friends who have been a big help. Cynthia and John Michael have returned to Utah where she has started back to work at the VA Hospital part time, finding good therapy in helping others with their difficulties. 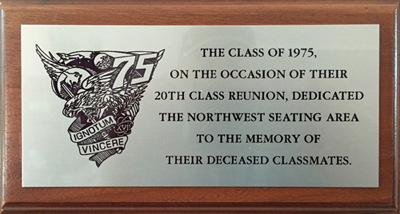 I’m sure l speak for every single member of our class in sending our best and hoping that Cynthia and all the families of our fallen classmates will honor us by coming to the reunion. Bits And Pieces Out Of The Electronic Mail Box. First of all let me “scream and shout and jump about” for a second to say if you have access to INTERNET E-mail SEND ME AN E-MAIL TODAY! Call your local Computer Resources guru if you're not sure how to do this. I’m compiling a list of E-mail addresses and will be glad to add your name and send the whole thing back to you. This also represents a heck ol' a lot quicker way to turn news around to you than this column (with its 4-8 month query/response cycle). Jeff Chappell had only written (the old-fashioned way) to the Scribe once in the previous I9 years, now he’s “lapped” two notes to me in the last couple of months, Jeff is chief of the Airfield Operations Branch at HQ AETC these days. He, Theresa, and their basketball team (they have five boys!) are starting to feel at home in San Antonio. Theresa’s on the waiting list for UT San Antonio Nursing School. Jeff asks if anyone else noticed Jay Schell on “Wheel of Fortune" last summer? Jeff didn’t remember specifics but thought Jay “represented us well." 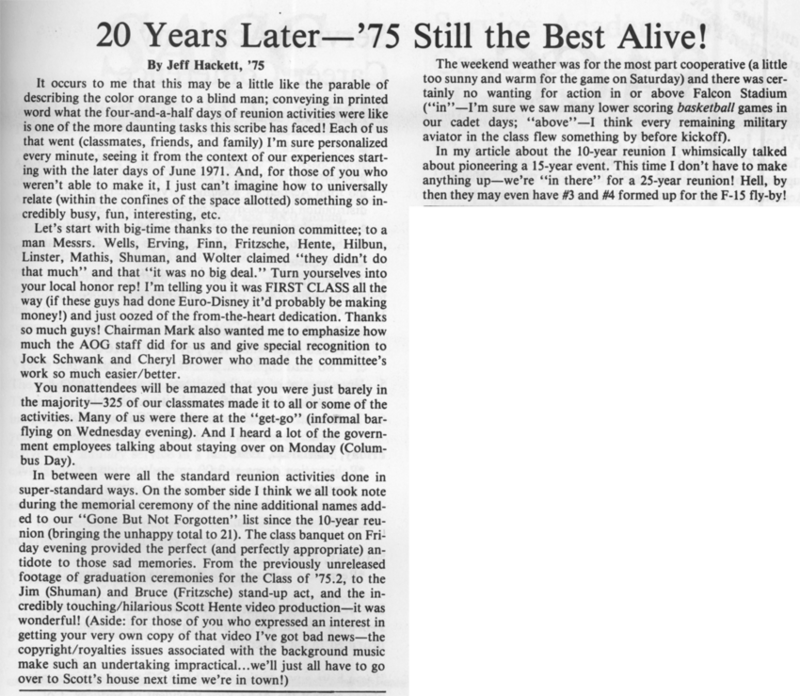 Other ’75ers at Randolph include’ Mike Marro, Deputy IM, “absolutely unchanged from that sunny June morning in 1975". Barry Abbott is in the Special Ops Branch in XOT. Gerry Micheletti is back in the Fighter Shop after a one-year remote to Korea. Roy Sawyer in International Training. Marlo Mellum “is a quarter of the way around the Main Circle at 19th AF." Charlie Bergman is chief of Fighter-Bomber assignments at AFMPC. In his travels Jeff recently saw Ron Doeppner down at Hurlburt where he is still in the (helicopter) cockpit and loving it. And finally, Jeff said he'd visited with Foster Bitton as he passed through on his way from War College to a new assignment in Heidelberg, Germany. Duane Jones checked in from Guam where he is “part of a grand experiment to see if a non-rated officer can/should be the on-island senior AMC rep and commander of the AMC Air Mobility Support Squadron.” Looks good so far and on top of that he’s having fun. Duane and Charlie Wintermeyer recently did the “...no kidding, we were class mates! ?” thing at a typhoon party. Charlie is the JAG for 13th AF. Quick note on a quick phone call: Rex Hoey, wife, and kids are at Sheppard AFB. He’s flying T-37s and “looking forward to retirement O/A 1 Jul 95." The Amazing “Mechanical” Article! In a case of incredibly poor timing this article like the one last fall is being written in the midst of half-unpacked boxes and used-up tubes of Ben-Gay. Note the new address and phone number (work number remains the same). Anyway, the result of this predicament is an article that’ll be long on bare facts and short on anything that even remotely resembles creativity. But there’s lots to pass along (in a mechanical sort of way) – two late Christmas cards, a letter, fifteen e-mail messages!, three phone calls and a BBQ. From Surprised To Sad In One Short Phone Call. Imagine the look on my face when my boss came to me one day in January saying there was a call on the secretary’s line from South America! Turns out it was Billy Stephan trying to get info on how to make “Gone But Not Forgotten" inputs. Our call was necessarily short and my notes are largely indecipherable but l expect you’ll find the bad news about John Patrick Owens‘ death elsewhere in this magazine. The Reunion Memorial Ceremony regrettably grows in significance. My apologies to Billy as I can't remember if it was Uruguay or Colombia that he's the Air Force guy in the Military Assistance Group for. I do recall him saying that his inclination is to retire this summer. Suddenly My Life Seems So Boring. Got a Christmas card, note, and e-mail from Bill Lyerly...don’t know where he found the time! Bill is the “Emerging Threats and Crisis Response Group leader, Bureau for Africa, USAID, Department of State.” And a very active LtCol in the U.S. Army Reserve. Alas, he's definitely not the center of attention in the family picture he sent! Bill and his wife, Syl, live in Maryland with daughters Heather and Kristen. Actually it sounds like Bill only occasionally gets to be in the Washington DC area – in '94 he spent the summer in Tajikistan (living in the Russian Embassy with the lullaby of machine gun fire on many nights), went to Geneva as a World Health Organization advisor on emerging diseases, and worked in trips to San Antonio and Southern California (managed to be there for the big earthquake). Along the way Wild Bill has turned into a font of knowledge on our classmates! Amongst the sightings he passed along: Mike Lischak spent 1Q95 in Riyadh as Task Force Flight Surgeon (TDY from his duties as chief flight surgeon at Beale AFB). Mike Heil and his family (wife, Donna, and six-month-old son) are also in DC where Mike is assistant director for Countermeasures in DOD Ballistic Missile Defense organization. Al Piotter is in JCS J-5 working Horn of Africa issues. Mark HOLMES has a similar post for Asian issues. Dave Hickman was in St. Petersburg, FL working for Martin-Marietta while his wife, Marie, worked as the news anchor-person for one of the local TV stations but (Bill’s version gets a bit confused here) they may or may not have moved to Findlay, OH...(hoping Dave will write and clear this up). In another “this may not be current” note Bill mentions that he saw Randy Mason while at USCENTCOM last year; Randy was J-3 Ops rep in the USCENTCOM CAT for Operation RESTORE HOPE (I have no idea what I just wrote!). Bill got a Christmas card from Hugo Posey who is still at the Pentagon (“where there are at least five sides to every story") as a branch chief in SAF/ISDM. Pat Ash has put in papers for change in assignment from 99th Airlift Squadron to Northwest Airlines (effective April). Staying on at Andrews are Steve Vreeland (in the 99th), and John Tamkun (in the 89th Command Post. One final tidbit from Bill to add to your sense of aging – there have been more graduating classes since we graduated than total classes before we graduated. Ouch! Speaking Of Ouch! Second belated Christmas card from Mike and Diane Buckley; the “ouch" has to do with Mike’s four months of absolute bed rest after he herniated a disc early in 1994. But he's back at it flying for Alaska Airlines and the ANG. Mike will give up C-130 flying this summer as he retires from the ANG – could be some “travel withdrawal” as he may be the only guy in the class who went to more places in the past year than Bill Lyerly! Last year‘s Annual Tour took him to Brazil, Uruguay, Cape Town, Canary Islands, and the Azores. Throw in the typical airline family personal travel (Mexico, California, etc. last year – Australia later this year) and I’m thinking the Buckleys could do some Samsonite durability tests. Mike mentioned that Paul Lotakis, who is in the same ANG unit, will be retiring with Mike. No Points Deducted For Format. Terry Young is living proof that even those inputs to the Class Scribe that are scrawled on the back of “Day Finder" pages will still be published! 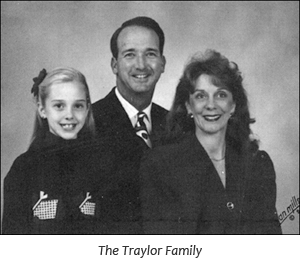 My read is that Terry just wanted to make amends with Bill Murray (who he had over for BBQ chicken that inadvertently became incinerated chicken) and his wife, Peg (spouses putting up with classmates visits/hell raising/story-telling is one of the miracles of marriage), by getting their picture in the Class News. It worked! Terry mentions that Bobby Thompson is living in Colorado Springs and flying for Northwest and that Jim Eken is down at Air War College (Dana and family stayed in Colorado Springs). We know that Terry didn’t fatally poison Bill Murray as he was one of my e-mail correspondents. He mentioned the visit with the Youngs (did not say anything about the meal) noting that Terry is a hard-working services squadron commander, that Peggy is driving her third “pink Cadillac from Mary Kay, and that their kids (two girls and a boy) are very tall. Now Bill gives us some intrigue: he says that Chuck Demoisy is the branch chief for Aircraft Modifications at HQ AMC – last article I reported that Terry had told me that Chuck was associated with a C-9 Reserve unit at Scott. Chuck, either write the scribe and straighten this out or quit leading a double life. Dan Speer apparently works for Chuck at AMC. He’s gotten his CPA license and will settle into that life in St. Louis area after retirement. Finally, Bill notes that Jon Ball is working as assistant to the executive officer for the Chairman of JCS (you didn’t think I’d try to spell that man's name did you)? Like Racquetball, It’s Easy To Learn! A number of folks took up my challenge to get out there on the INTERNET and drop a line to the scribe. This, despite a Checkpoints typo that added an extra “M” at the end of my address. Bob Awtry teased me with a “more to come" e-mail from Naval War College that has not yet arrived. In his opening shot Bob noted that Jim Dill, John Gaughan, Dan McCorry, Doug Miller, and Mike Straight have joined him as students while Kevin Donovan is on the other side of the desk as an instructor. Bob misses flying but he says the locale and the time with his wife, Jani and their two daughters is great. They’ll move on in June and I'm sure we can expect to see that picture before then...right Bob? Dean Spraggins will at some future date tell us the origin of his America On-Line login – “Catmomx3”. Nonetheless, Dean is a flight commander in the 513th Engineering and Test Squadron at Offutt AFB. Wound up there after narrowly escaping a B-1 landing accident in 1988; his “memento" of the occasion? Five pounds of steel inserted in the spine to keep him standing! Dean says the ACC takeover of SAC has been a confusing affair, “no clue where this is all going nor where the next assignment will be.” For now he and Jean are just trying to enjoy Nebraska. More News From The Pentagon. Scott Smith checked in from Washington, DC with a very informative e-mail. Scott is the military assistant to the administrative assistant to the Secretary of the Air Force (by his own admission “one helluva title”). The up-side is that he never gets bored by seeing the same type of paperwork day after day. Jan’s working in the operating room at Mary Washington Hospital in Fredricksburg, kids are in 6th and 3rd grades. The Smiths got to DC from McChord AFB where he was the 62nd Operations Support Squadron commander. They left behind Jim and Mary Lynn Fellows; Jim’s still the 7th Airlift Squadron commander (C-141s). Still keeps in fairly close contact with Richard Layman, who has been 2nd Space Warning Squadron commander at Buckley for about a year. Stanley Collins and his wife, (LtCol) Jackie, and three boys have all recently moved to Randolph AFB; he’s a T-37 PIT instructor. When Scott last checked with JT Wolter, he and Meg, and their two children, Lindsey and David, were living the High Life of Colorado Springs, where JT is a sim instructor for United; also flies 747s out of Honolulu when he's on the line. Doug and Allison Miller and their two children are now in Providence, RI where Doug is a Naval War College student after being a successful C-130 squadron commander at Elmendorf AFB. Scott ran into Joe May, in civvies, recently – believes Joe said he's currently serving a one-year tour as National Defense Fellow some where in the DC area. Chip Diehl just took over as director, Mobility Forces (AF/XOFM) there at the Pentagon and Mike Coman is in the same office. Guilt…It’s A Good Thing. Finally got to Dave Clough as he zapped me a message from his hometown of Omaha where he's lived with wife, Nancy, and three boys since 1988. He’s in private medical practice as an orthopedic and hand surgeon...and no ordinary surgeon is he – last year, he became a member of the American Society for Surgery of the Hand (highest professional honor for hand surgeons). Downside? "I realized that l had no more tests to pass or professional societies to join; the last professional hurdle has been cleared." Being so close to Offutt, and treating a lot of dependents and retirees on CHAMPUS, Dave says that he often experiences a longing for the good times in the blue suit...but that it's tempered by some of the less-happy memories and down-sizing “Ya-hoos". Can’t Believe I’m Saying This! You folks are getting so good at corresponding that it's stressing me out; for the third article in a row I’m running out of time and space. So here's the headlines (only) from other short e-mails I got. Chuck Schmitz is laying claim to being last ’75er to attend ACSC in residence, his Guard unit sent him. (Your Scribe may win out for folks taking it by correspondence!) We’ll both be done by June when the Reserve/ANG LtCol Board meets! Chuck has seen Bill Spencer who is at Maxwell as the editor of Airpower JournaI. Stan Jones checked in from Fort Worth where he works for Martin-Marietta (aka G.D.) in Control Law Design for F-16s and F-111s. He does flight instruction on the side and claims the only classmate he's seen in 10 years is Mike McClendon who works for American Airlines but does Reserve duty at the Martin facility. Jim Michelini also sent some electrons my way from San Antonio where he works at HQ AETC/Initial Training; says retirement in San Antonio this summer is looking good. John Kambourian had to use another grad to get his e-mail to my proper address but I'm glad to have it. John separated in '81 and has been working for the State Department ever since; just returned from a 28-month tour of Haiti (yes, he was there for the show). (John, your return email address got lost in the shuffle – please recontact me.) Bob Heath and Ric Lewallen again passed along updates. Bob relates that his old roommate, Russ Snyder, was just promoted to O-6 and was made the head of GB/GYN Department at Wilford Hall. From Ric: he knows where he’s going after he leaves Kadena (ACC Staff) – he just doesn’t know when. I hereby acknowledge “casual greetings/no-news-to-report” e-mails from Don Byers, Jim Carlson, and Duane Jones. Old Fashioned Electronic Greetings. Got a call from Willy Cosby in February. He’s now the regional sales manager for Hertz in Los Angeles after spending six years with United Airlines in San Francisco, Chicago, and New York. Said that being back in town with his family after 23 years was a real treat…most of the time! Bob Morrison squeezed in a phone call the day before my deadline as he overnighted in Phoenix. Bob’s just returned to flying 757s for Delta (out of ATL) after suffering a stroke three years ago in Frankfurt, Germany. The good news for those of us who are cool, calm, and collected (NOT!) like Bob is that they determined this was a genetic problem he had been living with since childhood. Bob’s also doing well as the support group vice commander for the Reserve Wing at McGuire AFB. And he’s engaged to be married in April. Mister Young, Drive On By My Room For Remedial BBQ Training! Unlike the carbonized chicken Terry served Bill, the ribs I fixed for Jeff Chappell were perfect! And the visit was nice too. After we got caught up with his e-mail last time it turned out that Jeff came to Luke AFB for an accident investigation in February that I coincidentally worked on in my Reserve capacities. Not much to pass along that wasn’t in the last column, just wanted to brag about my prowess with the BBQ! So Until We See The Whites (Red) Of Each Other’s Eyes…depending on how the publication/distribution of the next issue goes, this could be the last time you read about your fellow heroes and men-amongst-men, you’ll soon get to listen to all the gory details! Schedule those vacations, gather up those mementos, and get otherwise ready for the time of our Iives – it’s later than we think! You’re Only Remembered For your Last Great (Or Miserable) Deed! This will be the last article published prior to our reunion which means it will still be fresh in the editor’s mind when he sees me. That being the case, unless any of you aspire to be the next Kato Katelin (“star” witness at a homicide trial), we‘re going to keep this one well within the page limits. Which is tough because, as we get older and/or closer to reunion, you seem to have more and more great stories to tell! “Snail” Mail And Pictures A few things came by way of the good old U S A. postman. 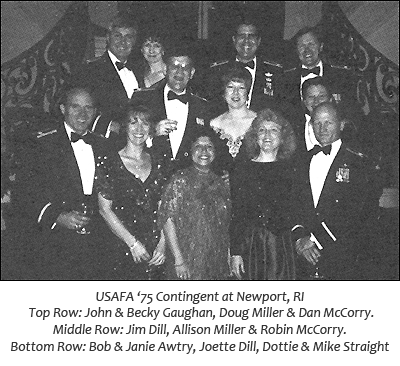 Although l scoff at this low-tech approach to communication I have to admit that it’s still got its highlights – like bringing us this picture of the contingent at Naval War College and their better halves. The picture comes courtesy of Jim Dill. The fun ended in the middle of June which is when Bob Awtrey zapped me a note with the final assignments: Bob to Air Staff XOX, Jim to the Joint Staff, Dan McCorry to SAF/AQ, Doug Miller to Little Rock as the Dep Com at Combat Aerial Delivery School, John Gaughan to AMC at Scott AFB, and Mike Straight to NORAD. Having trouble getting your checkbook to balance? Just bring it to the reunion with you and see if you can get Matt (Kip) Fong, the treasurer or the State of California, to look at it! This, hands down, is the most impressive stationary I ever received a letter on! Matt was elected last November defeating the former chairman of the California Democratic Party. He can lay claim to being the highest-ranking elected official of Asian-American ancestry in the continental US and believes he might be the highest-ranking elected zoomie. The amounts of money he deals with are S-T-A-G-G-E-R-I-N-G but then, by his own admission, so is the Orange County bankruptcy mess! LtCol Fong (USAFR) still does liaison officer duty in the L.A. area. A Classmate and Friend Has Resurfaced…Literally! Got a “hello again”/“good-bye” letter from Mark and Beverly Lenci as they prepared to leave for the Far East. Mark had just completed his three years as CO of the USS Houston (Nuc Fast Attack Sub out of San Diego), got selected for O-6, and was setting sail for two year in Yokosuka, Japan where he'll be embarked on the USS Blue Ridge (Command & Control Ship) as N-6 (C4l) for Seventh Fleet staff. Said he'd endure inter-service derisiveness if it came from any fine Air Force officer that helped get him and Beverly back to the States for Reunion. Before he left the West Coast, Mark had a visit with Jim Marburger who is an attorney here in Phoenix. We’ll assume that Jim is very busy with the product liability (“particularly aviation matters") work he does since he’s never managed a local phone call to the Scribe (a little intra-civilian derisiveness). That Other Electron-Based Medium Of Communication. Gary Thaller slipped a telephone call in about six hours before the deadline for the article (served as my alarm clock to get cracking on this baby!). The call came from Pueblo. CO where Gary is a stockbroker with Dain Bosworth. He, Romaine, and two children have been in Pueblo since he took the Air Force up on the 15-year retirement deal in Oct '93. Gary said he recently saw Randy Joslin who has recently retired from Space Command at Pete Field. And, in one of the better “he did it his way" stories, Gary lets us know that Captain (as in O-3) Harry Mathis is Chaplain at the (USAFA) Community Center Chapel. Unlike many of us, Harry’s measured pace at rank progression doesn’t have anything to do with misdeeds or ineptitude, he just went away for awhile (Gary thought eight or nine years) and then decided to come back. Looks like he might have the inside track for the last-guy-in-the-class-on-active duty award! Look! Up In The Sky! It’s A Bird! It’s A Plane! It’s Cyber-Scribe! We’ll review inputs from new e-mail correspondents and then (as space allows) hear from the keyboard junkies who have consistently been stuffing stuff into my mailbox since the day I first published the address. Again, I strongly recommend this medium to anyone who directly or indirectly can get to INTERNET! This magazine and Don Snelgrove will be hitting the streets at about the same time. Don zapped me from Germany to give me some up-dates and to let me know that he’ll be retiring on 1 August. Actually he won’t be on the streets at all as he's secured employment with Lockheed-Sanders in Nashua, NH. Said he and Sonja aren’t worried about cold New England winters as he grew up in Connecticut, she in Iceland. The Snelgroves and their three kids have been in Germany (near Ramstein) for just about seven years. Also got a quick update from Chuck Riordan, who has retired in a small town near Eglin AFB. Says he made the decision to retire after it became clear that the 17 years of flying was all he was ever going to see and that being a “staff guy" wasn’t something he could look forward to. While we were between issues of the magazine, "Bootros, Bootros Bill” Murray did a very short-notice, couple-month TDY in Zagreb, Croatia. He returned to Wright-Patterson AFB safely if not a bit cynical. Their at-home kids are busy; Rozi is “driving everywhere”, especially to tennis team practice, Evie had just finished basketball but was refilling any voids with studies and retreats. And Judy has completed an NRA shooting course with flying colors (maybe I’ll have her sub for me next time I have to do the small arms re-qualification). Jim Carlson (LtCmdr, USNR) has also been in South-Central Europe working for European Allied Forces Southern Command, doing daily intel briefings to the “big boys.” The work schedules are the “absolute, worst possible” – up at 0300 each day and regularly working until 1600 or later with a multi-national, multilingual, and multi-problematic group. What fun! Closing the loop on a mystery l pointed out in the last article, Dean Spraggins wrote to point the finger at his wife, Jean, for the user name “CATMOMX3". Seems she’s an inveterate collector of stray cats and, at the time they got the America On-Line account, had three to tend to. Know you'll be relieved to hear that Chuck Schmitz and I both successfully completed ACSC (he in residence, me by correspondence). He is one up on me though as he also just completed a master's program (poly sci) through Auburn University in June. Bill Lyerly shows no sign of slowing down – just got back from a couple-of-weeks TDY to Kenya. Bill's status with the State Department has been slightly altered, after being a political appointee under three administrations for over eight years, his position has moved over to that of a permanent civil servant. Bill wanted us to know he cleared up the confusion about Dave Hickman (see last article) with a personal phone call. Dave did move from Florida to Ohio but moved back and got reestablished with Lockheed-Martin in St. Petersburg. Just to keep things interesting he's also working for the National Forensic Science and Technology Center as its director of Organizational Development. Dave has already been responsible for over $1M in donations to this not-for-profit endeavor. Like the “Key Grips” And “Best Boys” – You Made The Credits! I hereby acknowledge “casual greetings/no news to report” e-mails from Bob Heath and John Kambourian. Together, We’ve Turned (Out) Forty! The ranting and wandering story lines above represent the attainment of what was for me a significant goal: 10 complete years (40 articles) as your Scribe! I can only think of three significant commitments of greater endurance/meaning in my life: 1) marriage to Debra (if she’ll have me, I’d like that to go on forever!, 2) time in the Air Force Reserve (once l qualify for retirement next October. I’ll be looking to stay on board as long as it remains as fulfilling and fun as it has been), and 3) time with McDonnell Douglas (been here since just before the 10-year reunion; with the feeling that, if there's many more weeks like the last one, l might not make it to the 20-year reunion in October!). As l reflect on it, I’d say the Scribe thing is most like the USAFR thing – as long as it remains fulfilling/fun and as long as you guys will have me, I'd like the chance to “keep on keepin’on.” In general, the short notes of feedback have been positive and very, very invigorating. Thanks! Any “talent” at doing this is only a reflection of my interest and enjoyment. But at this milestone let me take a chance and ask that any who feel cheated at being held away from this “opportunity” or any who have a strong desire to see a “passing of the pen,” please let me hear from you by correspondence, phone call, or at the reunion. And, if it be the consensus to “stay the course,” Hey! Let’s get going on the next 10 years! After all, (and as always), it's later than you think! Let’s Get The Second Ten Years Of Writing This Column Thing Started Off Right! That is – let’s talk about me! Actually, I'm guessing that my article (to be published elsewhere in this issue) concerning reunion goings-on will be of greater interest to most of you, so I might as well hide a little news from Arizona in here. Air Force Reserves: it’s good news! By the time you read this I will have pinned on Lt. Colonel’s leaves. Had hoped to tell you who else in '75 made it at this board, but I’ve seen nothing in print – I’ll aim to get you a more complete accounting in the next issue. McDonnell Douglas Aerospace; it’s more good news (with just one small setback). Three days after getting the call about my USAFR promotion I was informed that I had been selected for a program manager's position in the Military Programs Support Division here in Mesa. I`ve hardly gotten my feet wet yet but I'm very, very pleased with every aspect of this new responsibility! Except one. Although my new office is wonderful it (for the moment) lacks one critical amenity – a tap into the INTERNET. The geeks (now that I don't supervise or have anything to do with software engineers, I can call them that) tell me I'll be back on line (with a new address) soon. Magazine? We Don’t Need No Steenking Magazine! What the Class of '75 INTERNET Mafia lacks in numbers it makes up for in consistency! The news just rolls in 'round the clock/calendar and contributors have been known to receive an electronic copy of the article the same day it’s submitted to the editor (which means they read this about 11 weeks ago!). At any rate, here's all the news from the net. Chris Budinsky passed along command of Kadena’s AWACS squadron back in June and went to Oklahoma for retirement processing. He said he was evaluating the options, hoping to catch a job flying for the airlines or package folks and eventually make it back to Colorado. In his note he mentioned something about “the oldest five kids” – is there another set of five that are younger? Other Kadena refugees include Ric Lewallen who's chief of the Network Branch at ACC (he most certainly works with geeks!) and Steve Brown who is OG Deputy at Langley working for Bill Davis the OG Commander. The Air Force has tried to keep us well represented in the Western Pacific, as Duane Jones zapped to say he and his little ol’ tenant unit at Guam were getting ready to welcome the new host wing (ACC?) commander – Colonel John Deloney. Speaking of wing commanders and the “Mafia” we have going at Langley, I'm feeling in very good hands when I go to Hill AFB for Reserve duty now that Bentley Rayburn has moved in as 388FW/CC with Tim Murphy at the OG and Steve Barach as the deputy OG. Down at the other end of the ramp Ken Nease is flying with the 419FW (USAFR). I talked to both Bentley and Tim on the phone. They’re loving life to say the least although Tim was getting ready to take #1 daughter off to college (in Denver) soon after our visit. That’s a trauma I'm not looking forward to! Bentley and Debbi also have four children and are enjoying their first chance at getting back to a base they’ve been at before. State Department Briefing On Odds And Ends Information. Once again Bill Lyerly has checked in with much to tell. He’s just been awarded an adjunct faculty appointment at Joint Military Intelligence College and swears his course “Current Issues in Medical lntelligence and Humanitarian Interventions” is amongst the most popular there (see "geek", above). Just to fill the otherwise-idle hours, Bill also holds adjunct faculty positions at the USAF School of Aerospace Medicine at Brooks AFB and at George Washington University there in DC. Bill recently went boating with (Colonel) Mike Heil who was preparing to leave the Pentagon (curtailed 13-month tour) for Kirtland AFB where he’ll be commander of USAF Phillips Laboratory. Mike’s rumor mill included news of Julius Hargrove's retirement and Al Piotter’s intra-puzzle palace move from Middle Eastern Affairs to JCS J-5 shop. Bill also saw (in the barbershop of all places!) Greg Schmitt recently and discovered he’s been living in Annapolis for several years where he’s a senior software engineer for IIT Research Institute. Bob Dorsey is back at the Pentagon for a second tour (by request! ), working on the Air Staff with XORJ. Jerry Macken is also on Air Staff, in XOXJ. John Saxman is the support group commander at Vance AFB (AETC). Al BRADY left the Pentagon for an ESC job at Hanscom AFB. Dave Janetta has left his lofty position in me Pennsylvania state government to start his own company; to quote Bill, “Contacts, contacts, contacts...” Ted Hilbun had little respite from his job as 2nd Group AOC this summer as he commanded the BCT program. Ted‘s deputy at USAFA is the brother of our classmate, Col. (selectee) Gil Braun who at last report was enroute to be OG/CC for “an F-16 wing in Germany” (that's the problem with hearsay, it rarely has specifics). Jeff Neuman is flying for Delta out of New Orleans. From The Out-Of-The-Frying-Pan…Department. Got an e-mail from Jim Carlson; he just returned from extended (six month) USNR tour in Europe doing intel briefings to the brass about all that mess. Having gotten used to the lack of sleep and all the yakking he's now enrolled in law school at the University of Minnesota; said he should be done (June ’98) in time to handle summation at the OJ trial! Slightly Ahead Of His Time. Got the official invite to watch the launch/recovery of Brian Duffy’s next mission as commander of space shuttle mission 72 (lest you think it’s too much to ask for, note Kevin Chilton [USAFA ’76] is commanding STS-76). What the heck, we'll still be lifting Endeavor with our collective best wishes O/A 11 Jan 96! The Art Of Pacing Oneself. I’ll be back here at the keyboard in a couple of weeks with lots more stories to tell and if you didn‘t make it to the reunion you owe us one or two (i.e. write/call me today)! For once, I’ll let you off without my standard closing simply because l found one of Bill Lyerly’s observations to be so compelling: “The real reason we adults often ask kids what they want to be when they grow up is we're still looking for some good ideas!" Take care of each other.